You're already part of the powerful clan of Sloto'Cash winners- and now it's time for you to become an even more fearsome warrior of wins when you spin our new Samurai-theme slot Zhanshi with a 111% Match + 33 Warrior Spins! With 5 reels and 20 paylines, Zhanshi is a slot machine that will test your honor, discipline and concentration! Patience is key when spinning this game as you wait for three or more Wild Warrior symbols to appear and award you 25 Free Spins with tripled prizes. Continue focusing on wins and they will come to you when three or more of the scattered Temple symbols appear and award you 10 Free Spins with doubled prizes and chances of retriggering this feature for more wins. 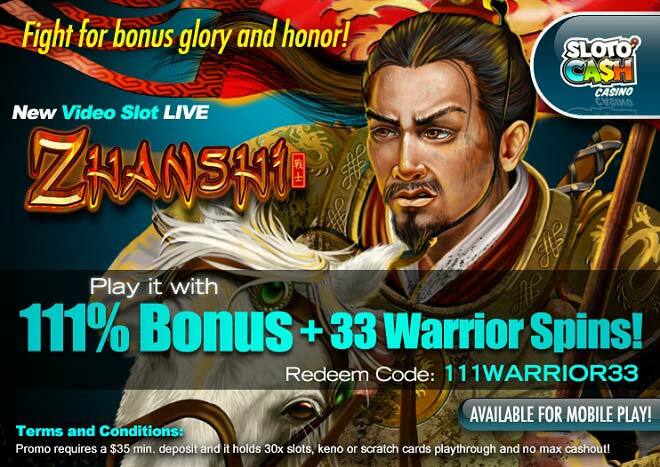 Battle for more riches with a random jackpot and more Zhanshi action!